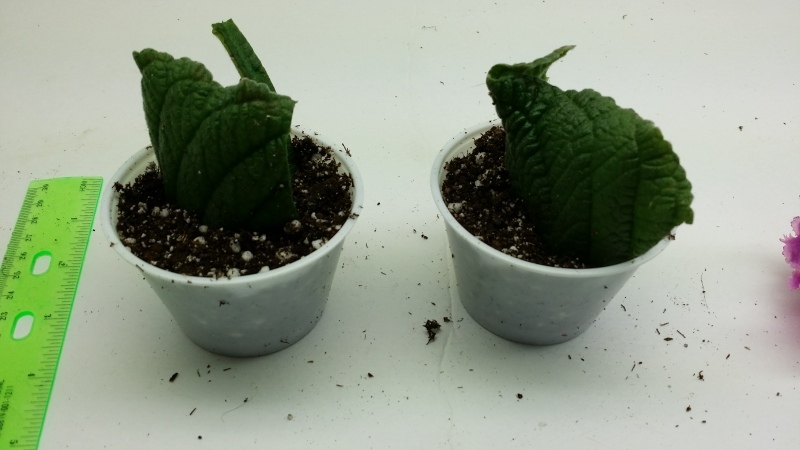 Streptocarpus propagation by leaf fragment can be very fun and rewarding. However, many new growers who have never done it before may be confused the many different methods available. Of course, our method also is one of many. However, I want to emphasize the following; I think soil and the amount of moisture in it are the key factors for success. I am sure that it is possible to propagate leaves in practically any light substratum and add many detail to the procedure. A lot of growers have developed combinations of substrate materials and procedures that work for them. Often, though, others growers, trying to follow these instructions, don’t have a good results. Why is this? These systems depends on delicate balance and slight variations in water and materials can tip the balance. For example perlite and vermiculite can vary significantly on ion exchange capacity, water retention and pH depending on batch, manufactures etc. Personally, I prefer a system with a higher degree of homeostasis. Homeostasis is ability of system to maintain internal stability and equilibrium. In our case this mean the ability to adjust to differences in growing condition that present in different households such as temperature, water, light, personal techniques etc. What is the solution? The answer is very simple. We need to use a soil that was developed by soil scientists. 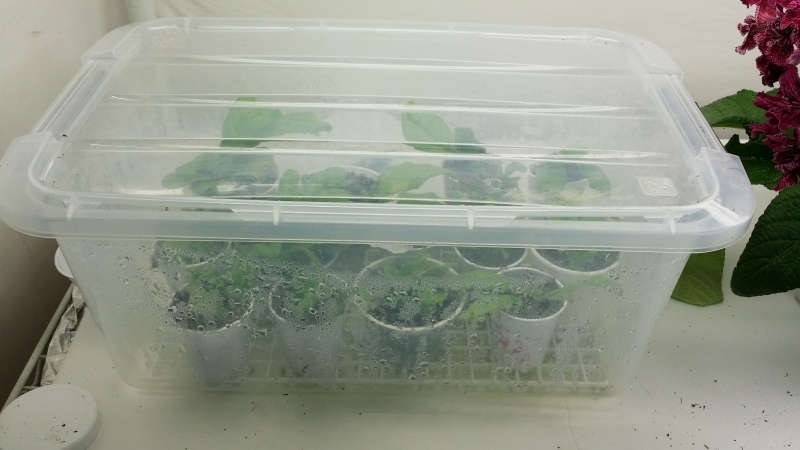 As I mention in my article, “Who killed my streps” commercial soil-less mix will provide the best, well-controlled environment for your transplants to root and to generate the plantlets (babies). I am talking about parameters such as porosity, acidity, buffer capacity, fertilizer, wetting agent, biological defense bacteria against root rot causing fungi and beneficial fungi that help the plant absorb water and nutrients. There are many commercial growing mediums available. As far as we know, only one does provide everything Streptocarpus needs for successful growth and propagation. At the risk of sounding like a commercial, it is so good that even if other factors like water, light are not optimal the plant/ leaf fragment will survive. That is what we call a homeostatic system, a combination of ingredients which together maintain the critical balances. The one we use is a professional general purpose soil-less growing medium, PRO-MIX BIOFUNGICIDE+MYCORRHIZAE. (In case you are wondering I don’t have any relationship with the makers of the mix. Unfortunately;)) It can be used directly or (which is much better) with equal part of medium grade perlite or equal part of shredded sphagnum (not peat). It is difficult to find shredded sphagnum. I crush mine when it is dry with hands or scissors. Actually, I like sphagnum more than perlite. So do some of our hybrids. Mix together one part of PRO-MIX BIOFUNGICIDE+MYCORRHIZAE with equal part of perlite (or non-peated sphagnum) really well and wet with water without fertilizer. Pro Mix has enough macro and micro nutrients to start your leaf fragments. Let it absorb water for a few hours. It is very important to have the right amount of water in your potting mix. How to know how much water is enough? Here is the easy test. Squeeze your mix in your hand tight. Water should ooze slightly between your fingers. If you do not see drops, add more. If it streaming, it means that your growing medium has too much liquid and leaf fragments will rot. Just add fresh mix to achieve desirable effect. The mix is ready. A couple of words about light. Many people grow streps under artificial light. Since leaf fragments have needs similar to plants simply put the dome under artificial light for 13-14 hours. 1-2 tube light is enough. Duration of light should be not less than 12 hours. In this condition development of the babies can be inhibit since short day signal the plant to go dormant. If you don’t grow under artificial lights and it is winter month you can put a fluorescent bulb in a regular table lamp to prolong your “daylight”. It may be just a few more hours. It would be additional light to your natural light from the window. Depending on the quality of your natural light (it should be bright) you may want to keep your dome under the lamp near window the full l 13-14 hours. Leaf fragments should not get direct sun light. It is very convenient to put in on a timer ($5). The number of babies you will get from the leaf transplant depends on the hybrid, leaf age, size of the leaf, and number of leaf veins. Baby plants usually grow near the cut vein. Young plant will be formed on the cut edge where the plants hormones come down the veins from the top of the leaf fragment to the wound site. Younger leaves have more hormones. The lower portion of leaf also has more hormones and, therefore, will give more babies. Don’t take old, yellowish leaves. After you cut your fragment you are ready to plant it. Some growers prefer to let the fragment dry for a while. 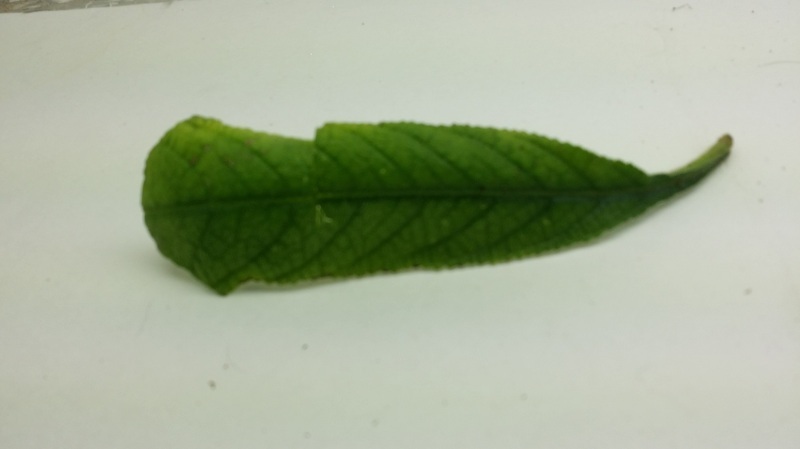 Others recommend to cut the leaf under water and keep it in water for a few minutes. We don’t find it necessary. We found it convenient to place leaf fragments to individual small pots/cups and then place multiple pots into the mini greenhouses (dome). Babies from different hybrids may be ready to be separated at different times. In this case we just take those pots with babies out of the dome and leave the rest there. 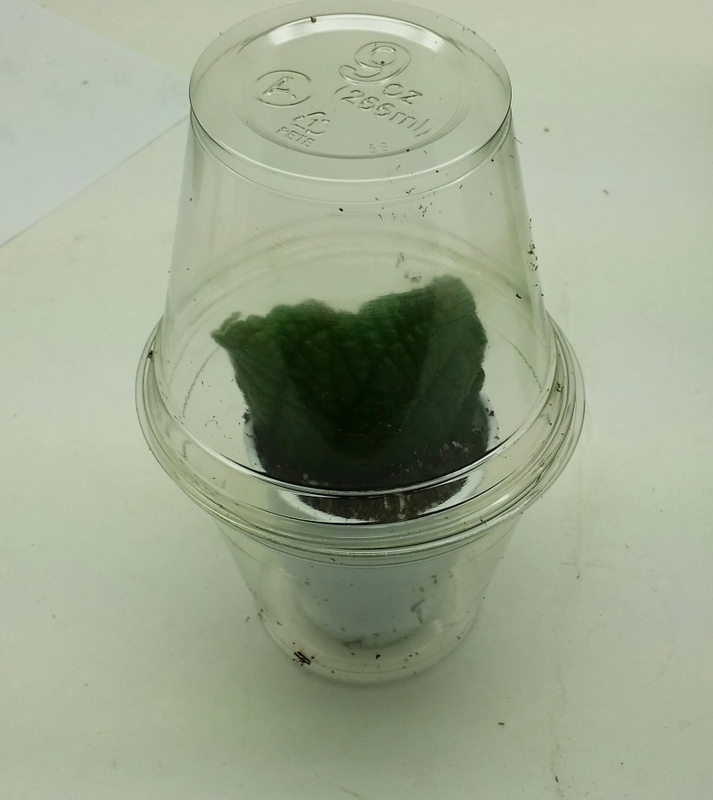 We keep our pots/cups with leaf fragments in clear, tightly closed plastic boxes. You do not need to do anything for the next two months. Most important is to not water the leaves. They have enough water to produce roots and then babies. We always have our boxes at least half full with pots/cups with leaf fragments. It means that we have enough water in the soil to maintain 100% humidity and that we don’t water the leaf fragments. However, if you have just one pot in a large clear container, it may be not enough. In this case use a small container (see photo below) or put additional pots with your soil. It is highly unlikely that your growing medium will become dry in a tight container but if it does, you will be able to see it, because the soil will become much lighter in color. In this case, add a little water and close the container again. Temperature. 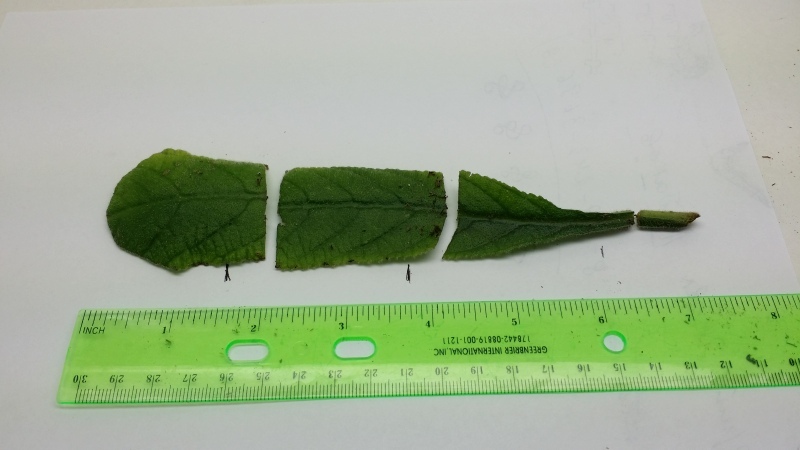 Leaf fragments need slightly higher temperature than plants. 20 -27 C (68-80 F) is acceptable. 24 -25 C (75-77 F) is optimum. Plant hormones. Some growers use rooting or other hormones to promote growth. We also find it unnecessary. We tried to use plant hormones. We still do not know whether it help or not. We notice that babies grown from this method are not better but may be worse than without hormones. We can only speculate that it is happening because the balance of hormones that originally existed in the leaf fragment is changed. We think that Streptocarpus leaves have enough plant hormones and do not need extra. 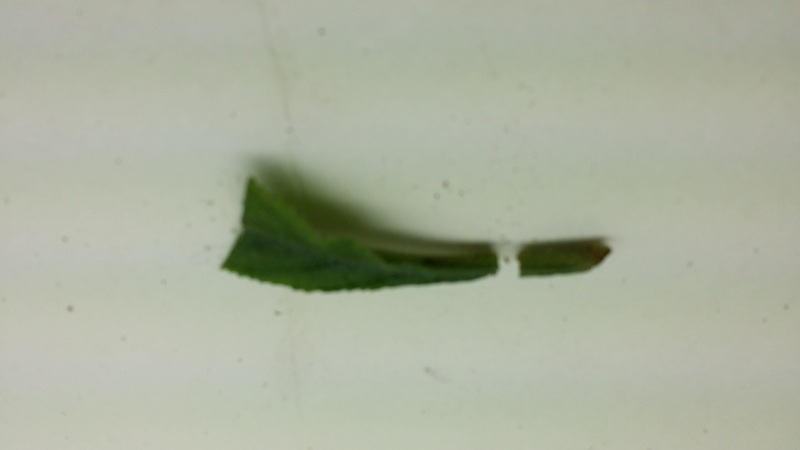 Make sure to cut off stem from the lowest fragment, because it might still have flower stalk producing tissue. In such a case, the fragment will start flowering instead of rooting. Insert lower part of the leaf fragments to your soil just enough that the fragment can stand vertically on its own. If you place it too deep (more than 1 cm) the little plantlets can be leggy and will use too much energy to push itself through the soil. That is because the baby plants grow from the edge of the fragment. On the photo above we put little black marks that show the approximate optimal depth. If the hybrid has a wide leaf and you want to have a lot of babies you also can cut out the central vein and then cut the resulting halves horizontally. 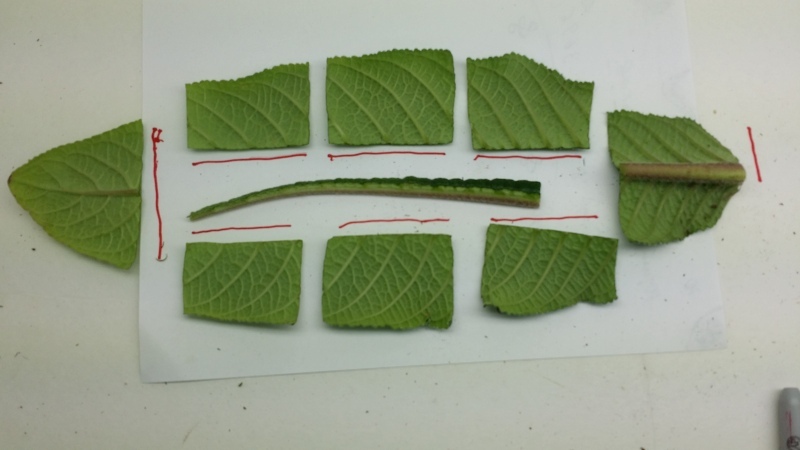 How wide should be leaf to produce babies by this method. It depends on the age of the leaf. 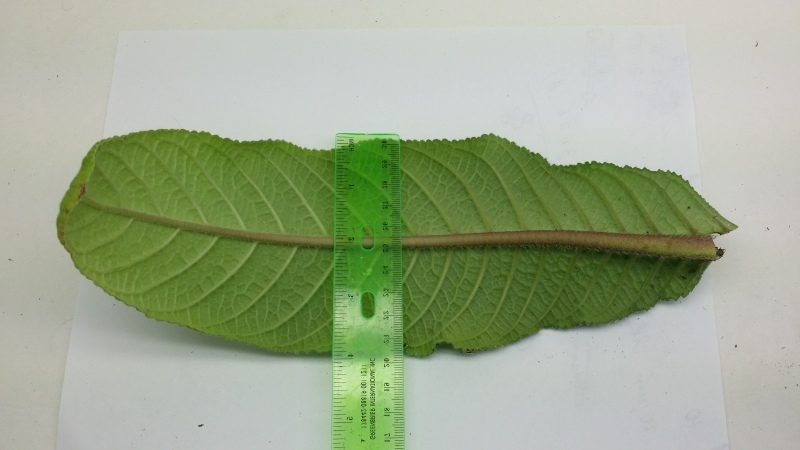 If leaf is young you can get babies from the fragment isolated from the central vein as narrow as 2 cm (1") For older leaf this fragment needs to be wider. The red line in the photo below identifies the edges that need to be placed into the soil. This is excellent ! I cut my leaves like the bottom picture. But I don't have a local source doe promix. I just used african potting mix and pearlite half and half.